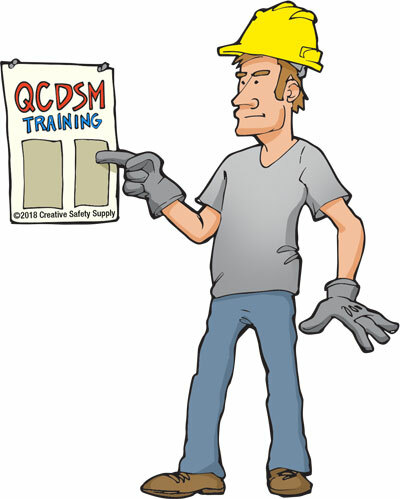 QCDSM is an acronym, which stands for Quality, Cost, Delivery, Safety, and Morale. These items represent an overall strategy that is used to improve business processes throughout many industries. While mostly used for manufacturing, construction, and warehousing jobs, it can be applied to many others. In fact, it is becoming quite popular in the healthcare industry as well as office jobs. This system is designed to take potentially large issues, and break them down into many smaller ones. These smaller issues can then be prioritized, and the necessary efforts and resources can be assigned to ensure things begin working the way that they should. Another benefit of using this system is that even when there is a large issue facing a company, the teams won't feel overwhelmed. This is because everything is broken down into much more manageable steps that can be accomplished easily. The QCDSM process is especially beneficial for small to medium sized businesses because they often have limited budgets for working on improvement opportunities. While large corporations can assign the necessary resources to address a large issue right away, that is not usually the case with smaller companies. Using the QCDSM process, large issues are broken down into much smaller steps. The company can then budget for each of these steps over time. Following this strategy, even large issues can be fixed without taking on debt or facing other issues. In addition, the issue that was once large will see incremental improvements over time rather than just remaining a problem for years on end. Companies often find that this strategy can yield them benefits almost immediately, and then continue to grow the benefits over time. Quality - The quality of the products that are produced must be very high. Just as important is that the quality must be consistently good. Many companies use a Six Sigma strategy to help improve quality when implementing QCDSM. Cost - The costs for the products being sold must be kept competitive. No matter how high the quality of a product is, many people won't buy it if it costs too much. Managing costs can be done by reducing waste, improving efficiency, and many other things. Delivery - Customers need to have their products delivered on time or they will find another company who can meet their needs. Proper planning and implementation for all orders will ensure a facility can deliver on time. Safety - With a more internal focus, safety is going to benefit everyone in the facility. Identifying hazards in the facility, and eliminating them, should be a priority for everyone who is working on any type of product. Morale - Keeping employee moral high can have a positive impact on many other areas of the business. Companies with high employee morale consistently perform better than those with low morale, making this a key point to focus on. When improvements are made on any, or all, of these items, a company will be able to better serve their customers. In addition, the profit margin will be improved, which means a better run company for everyone involved. 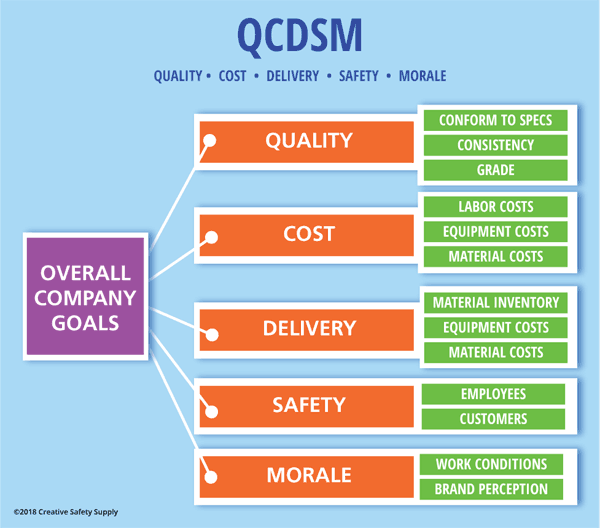 Unlike many other workplace improvement strategies, the QCDSM system is meant to help provide a very realistic approach to solving any type of problem or inefficiency that exists. 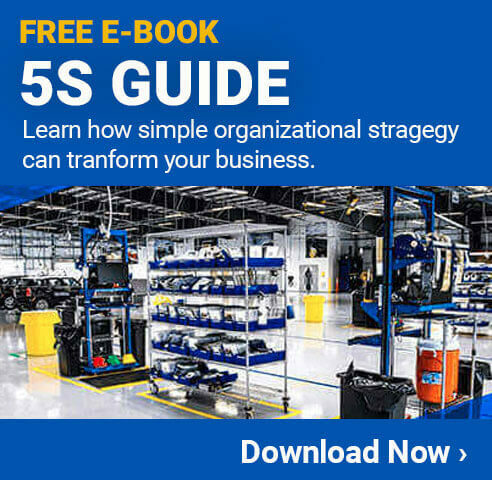 This is a very easy to understand system, and can work well alongside virtually all other strategies that companies implement for improving the workplace today. The QCDSM methodology offers businesses many different benefits. Improved quality, lower costs, more reliable delivery, better safety, and improved morale are just the obvious ones that jump out from the name. Each of these direct benefits will also provide a variety of secondary, or indirect, advantages to the company. For example, improved safety will also help to reduce the risk of fines, penalties, or even inspections performed by OSHA or other agencies. Any effort a company can make to improve workplace safety will have long-reaching benefits to the business, the employees, the bottom line, the customers, and even the community. Improvements made to how often products are delivered on-time will help to avoid the need for storing finished products, or parts for the next batch, when they aren't in use. This is often described as 'just in time' strategy, and has been shown to be very beneficial. A proper implementation of QCDSM will go a long way toward achieving the goals associated with just in time strategies. There are many ways that a company can implement the QCDSM strategies. In many cases, it helps to send at least one person to a formal training class or seminar in order to get the knowledge and experience needed to handle it properly. It is often quite common to hire someone in with experience in this area. That person can help to complete the implementation and run through a number of projects to ensure everyone is aware of how things should work. The QCDSM process is not something that can be managed by just one person. Instead, it is something that everyone in a facility must work together to achieve. With this in mind, each employee should be given the necessary training to understand what QCDSM is, and what their role might be. In most situations, it will be the front-line employees who are the ones who identify issues that need to be corrected, and also the ones that will be implementing the changes. Even if they don't come up with potential solutions, or the list of steps that needs to be taken, they will be the ones who are most directly impacted. The fact that employees will be the ones who are most likely to implement changes, they should be a part of the planning and decision-making process. Not only will this help to make the changes happen with fewer problems, but it can also help to identify future issues before they occur. When a manager or other person who doesn't perform the work daily comes up with an idea, it may sound great to their peers. When a front-line employee hears it, however, they may immediately see a problem that will occur. Having these individuals involved throughout the process will help to avoid this type of issue from the beginning, which will make the entire QCDSM process much more efficient.